Capt. Bryan DeHart is a well-known outdoor personality in North Carolina. A native of the Outer Banks, Bryan has been guiding clients both hunting and fishing since 1994. Bryan was featured in one of the original Mossy Oak productions of Whistling Wings, has had several appearances on ESPN’s Fly Fishing America, and is frequently seen on the Carolina Outdoor Journal, a favored statewide TV show on PBS. 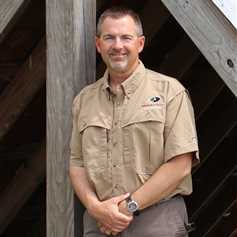 These years of experience in the field have garnered him expertise in evaluating waterfowl hunting properties and impoundments, hunting tracts for deer, bear and turkeys, as well as, assisting clients in the purchase of thousands of acres of timber and agricultural investment properties. Bryan joined Mossy Oak Properties/NC Land and Farms in 2004, was a founding member of Mossy Oak Properties/NC Land and Farms and is now a partner in Mossy Oak Properties NC Land and Farms. He focuses solely on rural land sales and was agent of the year in 2007 and 2010. His kind spirit and warm nature has never met a stranger and Bryan’s network of outdoor enthusiasts, timber specialists and land enhancement professionals make him the perfect choice for the Mossy Oak Properties NC Land and Farms front man.